Integra Tower The Intermark is a world class sustainable office tower which is the gateway into the Kuala Lumpur city centre. 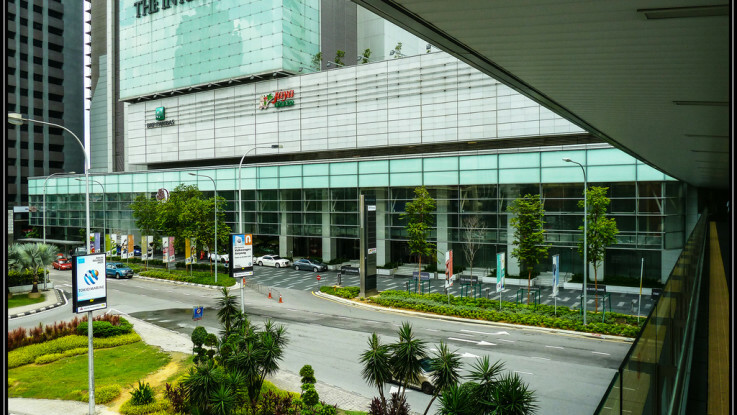 Situated within the prestigious business center, at the connection point of 2 major commercial backbones – Jalan Tun Razak and Jalan Ampang. The Intermark sits is only about 2 minute walk to Ampang Park LRT and just 500 metres from Petronas Twin Towers. The calibrated corporate spaces and sophisticated business amenities offered bi The Intermark meets the expectations of discerning multinational corporations. The corporate environment are complemented by a retail podium and an upscale international hotel – Doubletree by Hilton Kuala Lumpur City Centre Hotel, the first in Southeast Asia. Integra Tower’s platinum LEED certification means 40 percent water-efficiency as well as 20 percent energy savings. In addition, CO² emission is expected to be reduced by 1,663 tons per year. This popular development near KLCC pays homage to environmental protection. Tenant will enjoy its high-performance building systems which reduce water and energy consumption while maintaining a high level of indoor environmental quality. Integra Tower is designed column-free with a central core. There are 3 main zones in this office tower, namely the Low, Mid and High Zone. Each office unit in the Integra Tower ranges from 3,000 to 25,000 sf. There is a number of layouts to be selected from , suit each tenant’s business needs and preference. 24-hour security, parking bays, a grand lobby are some of the facilities offered within The Intermark office building. Furthermore, tenant will gain access to the Intermark development which houses retail, F&B and entertainment facilities. Integra Tower could be easily accessible through Jalan Ampang or Jalan Tun Razak. Various highways lead towards the development, namely Ampang Elevated highways or the SMART highways. In addition, various facilities offered within the vicinity, including shopping centres, hospitals and tourist destinations. Besides, this office tower also offers easu access to Public transportation, as bus and LRT stops are all within 5 minutes walking distance to the Integra tower, complete with covered walkways. Vista Tower is the adjoining office tower within the same The Intermark development. Integra Tower is definitely one of the best choice for discerning corporations seeking the ideal balance of functionality, sustainability and connectivity. This world class office tower which offers a prestigious office address. is in line with Kuala Lumpur’s vision to be a world-class business, working and living environment. – CO² emission reduction of 1,663 tons/year.